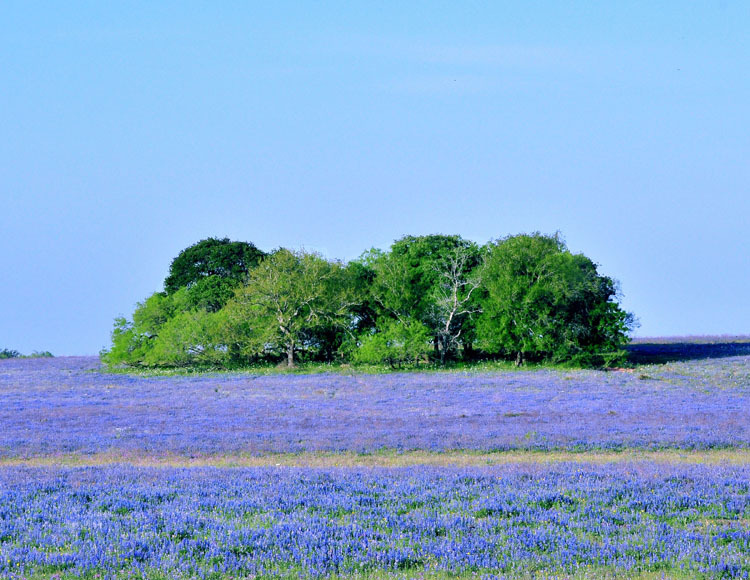 Lush blue horizons burst in profusion across Central and South Texas this April, creating a feast for travelers’ eyes. Our cold, wet winter gave us one of nature’s grandest shows. Delayed March winds rustle in undulating patterns through fields of blue buffalo clover. Wading carefully trying not to crush even one precious head, the fragrant scent so subtle and unique leaves a memory never to be forgotten. Legends of the blue phenomenon abound in this land held precious by all who live on it. The Indians knew that buffalo were drawn to these delicate fields they called buffalo clover. They and the flowers were here before Europeans from Spain and France, then Mexico and later Germany, Holland, Ireland, Poland, Czechoslovakia, England and others set foot on this land. Enclaves and sometimes quaint communities still exist where the flowers bloom while customs and languages of these countries thrive just miles from booming industrial giants. A cultural mélange savoring its differences. Yet the legends survive. The Tejanos called the flower conejo because it reminded them of the cottontail rabbits. Pioneers called them bluebonnets envisioning the sun bonnets worn by the women. The most popular legend and civil by all means made immortal believe it or not, by a yankee. MS Word red lined this word, am I supposed to capitalize? 🙂 Now, what Texan would do that? When Tomie dePaola came to the LadyBird Johnson Wildflower Center outside of Austin, I drove to Austin, bought twenty something Legend of the BlueBonnets and Legend of the Indian PaintBrushes which he graciously signed. They are now in schools and the hands of children I love. Who knows, maybe he will come again. The beautiful story of an unselfish orphan sacrificing her prized doll for the good of her people is cherished by children all across the nation. The bluebonnet legacy left by her treasured doll’s blue jay feathers is just reward for such a noble act. Yet other legends also survive. J. Frank Dobie, born in Live Oak County, Texas famous for writing about Texas Legends asked Mrs. Bruce Reid to share her collection in his book, Legends of Texas: Pirates’ Gold and Other Tales. These are not for the fainthearted, and the link here does not include the end of the last story, (A purchase, maybe.) but one can garner the many facets of the legend. During my tenacious search for the quintessential bluebonnet legend, my favorite find is the story of the Pinks which shows so vivily the inner conflict of the Tejanos during the revolution. I’m still trying to locate a 1926 copy of Mary Dagget-Lake’s book. The Daughters of the Republic of Texas immortalized her work. They have a library on the Alamo complex that houses many wonderful artifacts and historical archives. And so the legend lives on. May our children, theirs and theirs continually enjoy the beauty we see today. From BJ to everyone who loves the Texas Bluebonnets. I, too, remember reading The Legend of the Bluebonnet by DePaola. It was, by far, my most favorite legend about our beautiful state flower. Each year when Spring unfurls her many blankets of color across our part of this great state, it is like a beacon to my heart to grab a picnic lunch, a camera and the children for the wonderful annual ‘bluebonnet picures’. Lately I’ve just had be satisfied with enjoying the pics of my nieces and nephews with their families. But one day,hopefully soon, I will grab my mom, and my sister and we will, once again travel those blue laden highways. Thank you for sharing this story.